Founded in 2010, Designers / Makers has grown from a local design market in London into an agency supporting freelance designers - an essential resource to help create a strong and supportive design community across the UK. We chatted with Sophie Rees, the director to explore her opinions. We provide an affordable D/M Membership that offers an online platform for designers to sell their work and curate regular selling/marketing events in collaboration with other cultural institutions to reach new audiences. We also provide professional development information and opportunities for Members to help with all aspects of running your own creative business. The information we provide is created to help Designers based Internationally and at varying levels of development. Our online shop is a place in which our members can sell their work as part of a community and a place where we can offer customers unique, limited edition products. D/M has grown organically since its very small beginnings in Hackney Wick. As a student I made jewellery and become disenchanted with the markets I was selling at – they had no atmosphere and the quality of goods on sale varied from talented design students down to t-shirts imported from China. So when I arrived in London after graduating I decided I would create my own market to help support people like myself – trying to make money from their creative endeavours. The idea was to create a design community – open to those who had unique products and the desire to build their own successful brand. The markets grew in size and popularity and at the same time I saw a gap for a design organisation that supported those at the early stages of their business. Because I was in a similar position I knew what I needed – outlets to promote and sell my work in order to make money and pay the bills. So D/M has always focused primarily on events and collaboration with other arts organisations in order to benefit our members and make connections to the wider design and craft community. It has been a lot of hard work, hair pulling and empty pockets but steadily it has grown into the agency I hoped it would – we now offer a really comprehensive membership that focuses on selling opportunities and business advice. Its so nice attending the D/M events and seeing all the designers swapping information and supporting one another as well as being picked up by retailers etc. 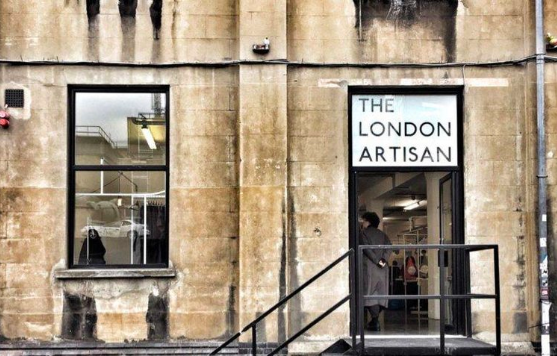 The London Artisan is a curated marketplace in the heart of East London. A collaborative project between Designers/Makers and The Old Truman Brewery. The London Artisan offer’s a diverse, quality, shopping experience that celebrates independent producers and makers. But more than that, it’s about people and place; meeting the makers, conversation with friends and embedding the social back into shopping. We support makers who produce high quality, unique and locally made products. I think there is a demand for affordable well designed products that have the appearance of a well crafted, handmade product. With new technologies and processes available to designers, they are able to meet this demand whilst retaining their passion for traditional crafts. Places tend to become design or arts and culture districts due to the artists and designers that live in them. Their work is often seen through street art, exhibitions, markets etc and essentially their work is them. East London is where we run The London Artisan, it has always had a high percentage of artists and is very multi cultural which is what creates such a rich diverse culture for the area. Collaboration has always been the focus for Designers/makers. Our starting point for any event is to collaborate with a cultural organisation that we feel has a similar outlook and connection with the design and craft community. Throughout the years we have worked closely with individuals, collectives and groups to run workshops and talks to create opportunities for our members and to engage a wider audience with design and craft. Our events are always free to attend so that anyone interested in the design and craft sector can attend - whether a young student, tours or established within the industry. Our events often have small budgets for marketing so it is very important for us to forge good working relationships with the media and work closely with magazines and online content providers that speak to our audience. We are created The Artisan Talks so that the community of sellers and the public can have an opportunity to share ideas and interests with a broader community of artisans and creative organisations. the online shop is there so that anyone who cannot attend our events in London is able to buy a smaller selection of the work online. or perhaps someone attended the event but couldn’t buy something at the time - the online shop lets them purchase from the designers in their own time.